While I do have some issues with the film’s approach to telling this story, First Man is still an impressive technical achievement, that is carried by a strong performance from Ryan Gosling. For more on the film itself, you can read my full review right here. The Blu-ray also includes a commentary track with Chazelle joined by screenwriter Josh Singer and editor Tom Cross, two deleted scenes (House Fire and Apollo 8 Launch), and eight featurettes on different aspects of the production. First up, Shooting for the Moon focuses on what drew Chazelle to the material and how they approached depicting a national hero in a very grounded and human way; Preparing to Launch is mainly about how they strived to reveal who Armstrong really was as a person; and Giant Leap in One Small Step features Armstrong’s sons reflecting on how their father remained very humble and didn’t really view himself as a hero. Where these three featurettes very much focus on the characters and story, the next five break down more of the technicals behind the film. Mission Gone Wrong specifically focuses on the lunar training vehicle crash sequence, and how Gosling did his own stunts for the scene; Putting You in the Seat reveals the film’s groundbreaking use of an LED wall to project images behind the simulators, allowing them to shoot most of the space backgrounds in-camera; Recreating the Moon Landing focuses on the climactic lunar landing and moonwalk sequence, which they opted to shoot outside in a grey quarry instead of on a sound stage; Shooting at NASA shows how they incorporated some of the real locations into the film; and Astronaut Training shows how the cast basically went through real life space camp in order to prepare for their roles. These featurettes are mostly all brief in terms of length, but when viewed together, they do an excellent job of showing the amount of work that went into the film, allowing me to gain a deeper appreciation of the technicals behind it, all other quibbles aside. While First Man was practically made to be seen on an IMAX screen, it’s still worth seeing on Blu-ray if you missed it in theatres. 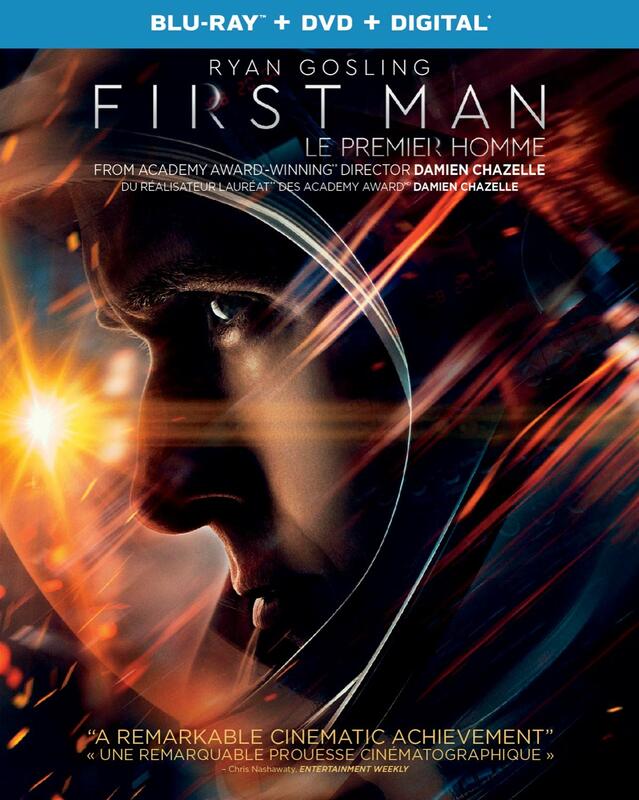 First Man is a Universal Pictures Home Entertainment release. It’s 141 minutes and rated PG.